While most have experienced the rush of safari from an open Land Cruiser, there is nothing more exhilarating than a horseback safari (and you don’t need to be a professional rider). Ant’s Hill in the Waterberg is a three-hour drive from Johannesburg and a haven for professional and amateur riders who get to enjoy Africa from the saddle. From the time of our check-in this luxurious lodge was everything we could have wanted when wanting to unwind in the African bush – and more. Aside from being situated in a malaria-free area, the lodge caters to those who are looking for a rustic feel, whilst enjoying all the luxurious amenities of the modern-world. 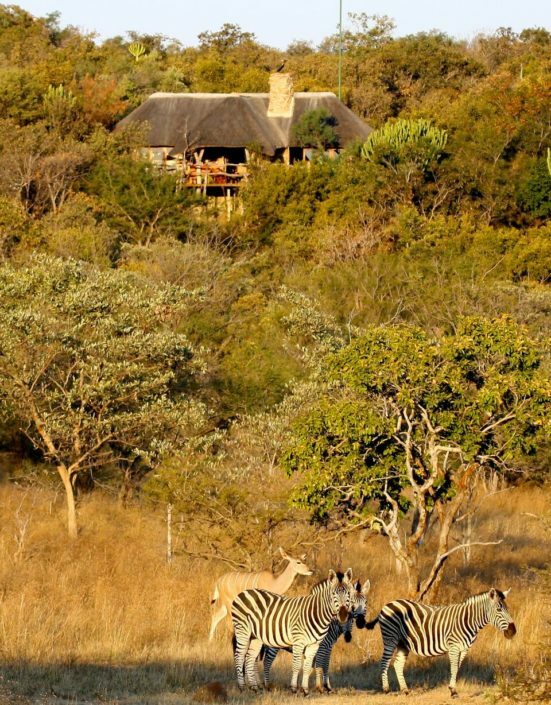 Ant’s Hill (set on a hill), overlooking the lush African acacia-filled veld, open grasslands and natural waterholes is the perfect escape for families, honeymooners and the occasional peace-seeking celebrity (rumor has it that members of Pink Floyd like it there, too). 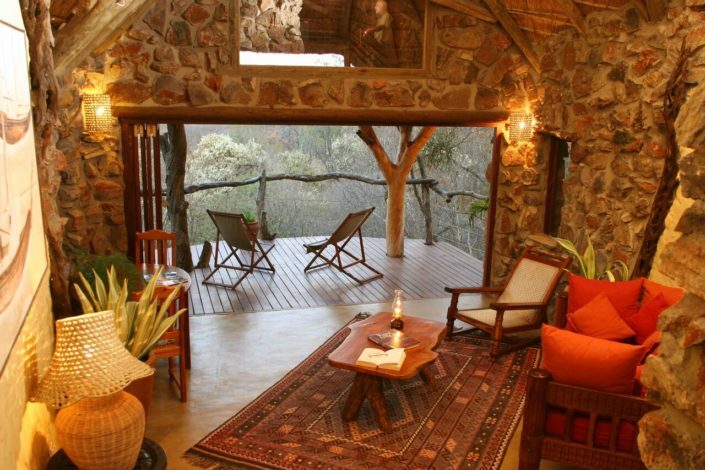 Built from the local stones of the region, the lodge feels like a home away from home. 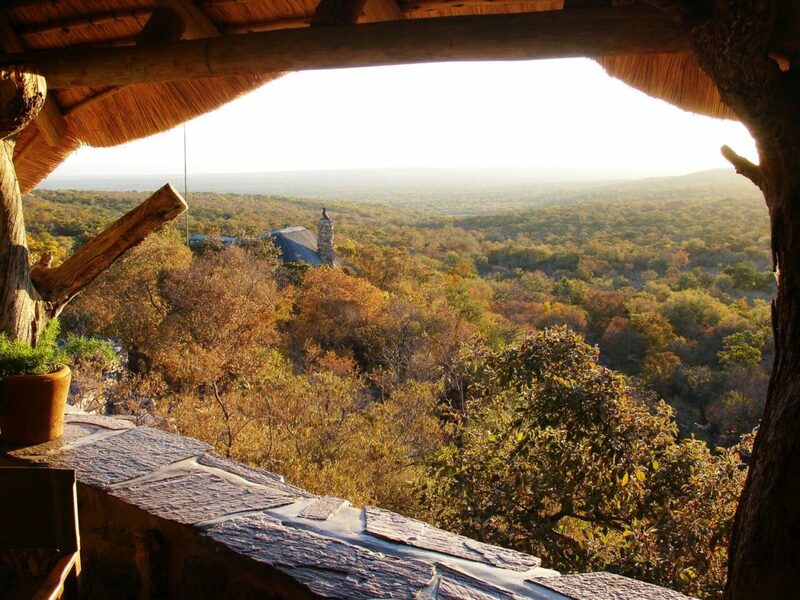 With open plan windows sporting panoramic views of the bush from the bar, restaurant, boma and pool, every touch is intended for guests to feel at home, including the fact that you are encouraged to help yourself to a drink after a long ride in the bush. 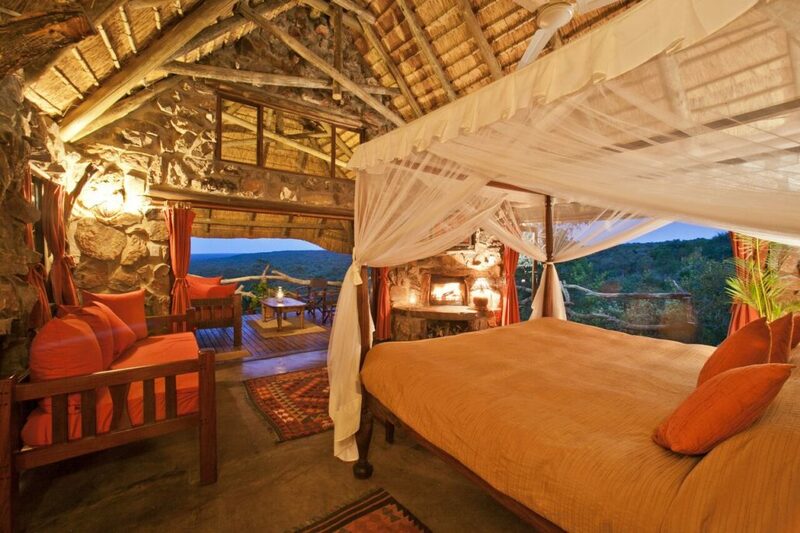 Our room (a double story, expansive bush villa) was what all ‘I Dreamed of Africa’ reveries are made of. Following the winding curves of a precipitous cliff, bathrooms and infinity private pools virtually melt into the surrounding bush – it is easy for time to stand still at Ant’s Hill. With rooms designed to match the colors of Kenyan roots and Swahili design, guests can enjoy total privacy from any area of their suite (bar the occasional peeping giraffe). Our days were filled with many activities – starting with breakfast and an early morning horse ride. Riders of all levels are welcomed as the reserve has over 90 horses to cater for riders’ ability. One of our favourite things about Ant’s Hill? Guest are not woken at 5 am, but rather at the more reasonable hour of 7 am for us lazy vacationers. After enjoying white rhino, buffalo, leopard and rare Roan and Sable antelope, it was time to head back to the lodge for a mid-morning massage or hands- on reptile workshop (all activities at the lodge are specifically catered for according to your individual interests). Should lounging at the pool with a book be more in line with your interests, you have a few hours each day to enjoy the sounds of birdsong while you work up an appetite for a three-course lunch. As we are vegetarians, the lodge catered specifically for our needs (which include Kosher food, with advanced notice) with some of the best cuisine we have had while on Safari. 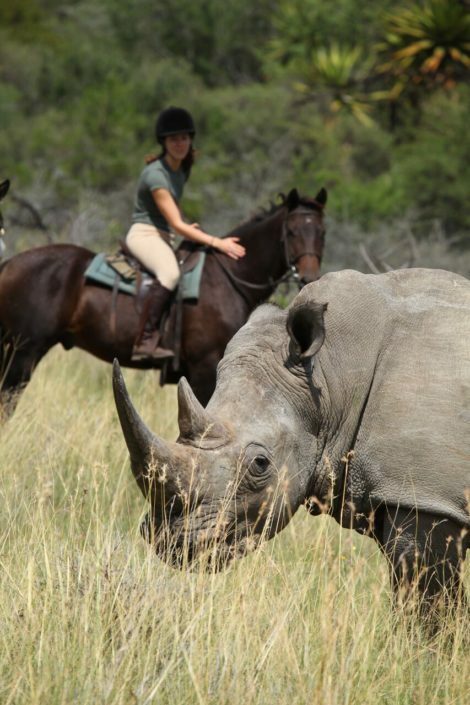 After- lunch activities include another ride, guided bush walks, mountain biking, game tracking, bird watching or traditional night drives – after high tea of course. Our favourite activity at Ant’s Hill was one which, for us, which offered one of the most unique African experiences was sunset with the Rhino’s. In association with the Save the Waterberg Rhino initiatives, the reserves Rhinos are fed in a secure place each evening which allows guests to enjoy sundowners while watching these magical and highly endangered beasts close up in their natural habitat. In all of Passports & Perignon’s extensive travels, this was by far the best activity that we have experienced in the African bushveld. 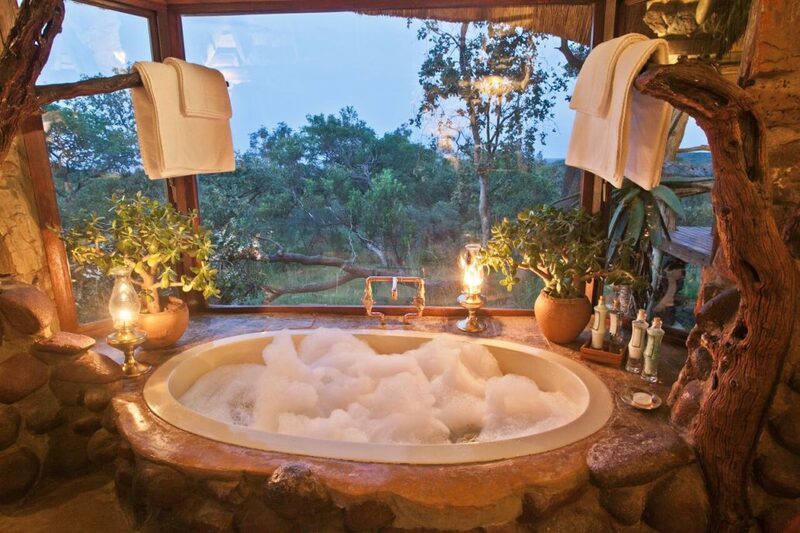 After dinner the lodge offers another type of safari – a sky safari. At an additional cost this activity allows guests to gaze atthe night sky as you have never done before. With advanced telescopes, astronomical video cameras and talented astronomers and communicators (who have decades of experience), you are introduced to the wonders of the universe – live and in colour. The experience is designed for those with no previous knowledge of astronomy and the aim is to take you on a tour of the amazing African night sky and all its wonders. With a glass of wine in hand and the smell of the fresh African air, guests can see the moons of Jupiter, the rings of Saturn or the phases of Venus depending on the time of year. Winding down the evening in front of an open bonfire with a coffee in hand, it is easy to see why most of Ant’s Hill’s guests return from year to year. Unlike traditional safari lodges, this intimate and personalized lodge allows guests to see Africa on their own terms while doing the things that they love most and leaving with a deep sense of appreciation for Africa. Whether or not you are from here, it is hard not to feel the tug of Mother Africa on your heart strings, pulling you back to the most magical place on earth.